Cloud – with its agility, speed and low cost – is the key enabler to help agencies test and innovate new solutions faster than before. 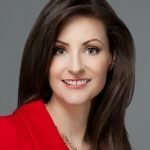 Oftentimes, however, agencies think of cloud as just technology and software when instead they should see cloud as their organization’s business strategy to create greater impact for employees and citizens. 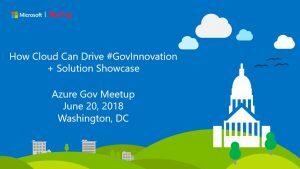 In this exciting era of rapid gov innovation, we invite you to join the Microsoft Azure Government DC user community for our next Meetup, How Cloud Can Drive #GovInnovation + Solution Showcase, on Wednesday, June 20, 6 – 8:30 p.m., at 1776 in Washington, DC. We’re excited to bring you Kevin Jackson, a globally-recognized cloud computing expert and founder/author of the award-winning blog, Cloud Musings. Kevin will share his experience and expertise on cloud innovation and keys to developing a successful cloud business strategy. • Brett Goldsmith, Program Director and Jim Mullennix, Cloud Solutions Architect of AIS will talk about a high-profile application they helped move to production in Azure Gov in 2018. 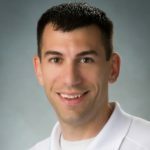 • Adam Ormond, AIS Solution Architect will talk about his recent work to help a defense agency achieve ATO for their Azure Gov-based application. In addition to engaging content and discussions, there will be excellent networking opportunities and refreshments at this Meetup which is FREE and open to the public. Be sure to RSVP and secure your spot; and help us spread the word by inviting your colleagues and connections, too!